I needed some command figures for the second set of thegns I have as part of the Anglo-Saxon army. I had a few spare figures from Gripping Beast left over. 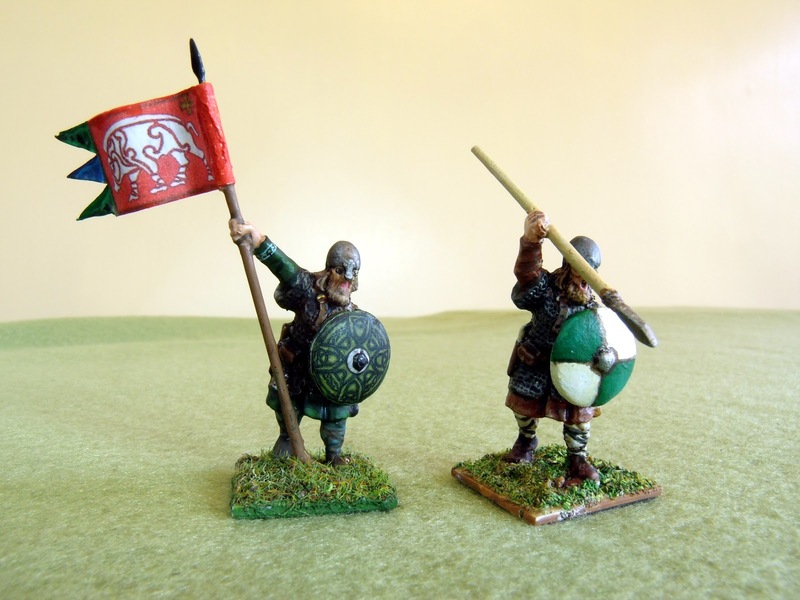 These were ordinary spearmen, but a little work with wire and green stuff turned them into a standard bearer and horn blower. First up the standard bearer. Here he is, with a shot of the original figure (another example obviously), for comparison. First job was cut away the original forearm, and make a slot in the shoulder to allow the upper arm to move into its new position. A hole drilled into the upper arm to take a piece of soft wire allows the new upper arm to be formed. I put the banner staff in place at this stage, attached to the end of the wire armature. I found that this allowed me to model the hand in situ more easily and accurately. After I was happy with the hand, I modelled the tunic sleeve, then made good the cuts and bends on the mail shirt. The staff is a piece of steel rod with a point hammered and ground. The banner is the one I posted here, if you remember. Glued down onto a pit of paint tube and bent to shape, I think it looks the part. The hornblower is slightly simpler. A cut or two around the joints of the arm, a couple of bends and some modelling of the hand and the horn from green stuff. The starting figure again is pictured with the conversion for comparative purposes. I know that they're pretty minor conversions, as far as these things can go, but they're just the thing to do the job I want doing. Nice job on the conversion. 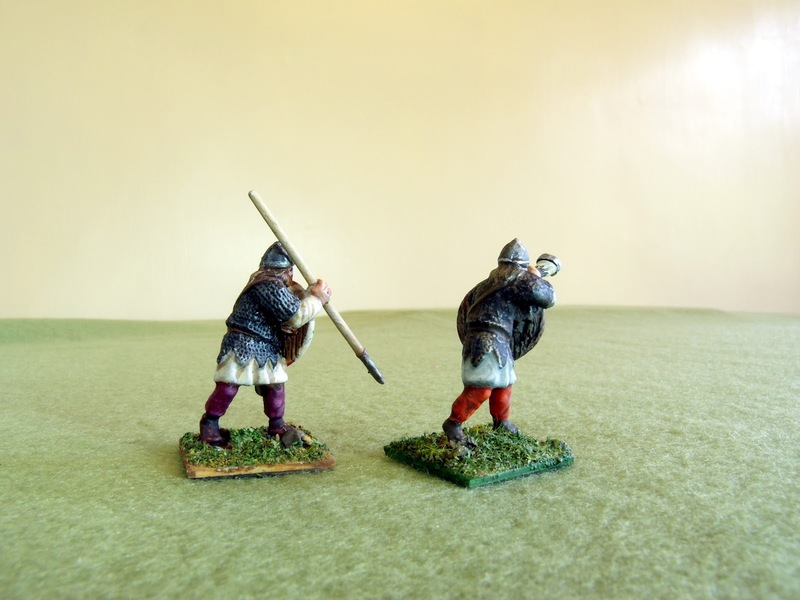 I am daunted by doing such on 15mm figures. The last few times I have tried have not gone well. Very nice conversions. Subtle ones like this are sometimes hard to spot but you've done a great job with these figures. Thanks guys! Chris if I can manage it in 28mm, I'm sure you can pull it off in 15!